So just how did this sport come about? Short Course Off-Road racing history seems to be a mystery for many. Because of this it became necessary to trace the sport back to its roots and give credit due to those that helped create this exciting form of racing. In your reading you will find a lot of factual information from related readings, race reports, and through interviews with the pioneers of the sport. Unlike the birth of a child no date is marked down as the beginning of short course racing. It just seemed to take on a life of it’s own. Although like a child it has now grown into an adolescent with plenty of room yet to grow. Before what we call short course today there were various forms of racing events off-road. Although not termed off-road racing at the time there were hill climbs, mud runs, sand drags and obstacle-type events. One event we know of was won by Rod Hall in 1964 titled the Afton Canyon Jeep Junket. Where and when off-road racing actually began has been erased by the shifting sands of time. Therefore, since the previous events didn’t stand up to history’s test of time it has been accepted that the term off-road racing “officially” began in 1967 when the National Off-Road Racing Association NORRA staged the Mexican 1000 down the Baja Mexico peninsula. In fact it was Pete Condos who is credited with the term “off-road” during one of the earliest NORRA meetings. Ed Pearlman, who organized NORRA had earlier held Jeep fun races during WWII to help keep troop moral up. The NORRA Mexican 1000 was a unique form of motor sports that was billed as a 1000 mile race demanding the most of it’s competitors and their machinery across Baja’s vast desert. The event paraded in Tijuana with racing from Ensenada to La Paz. Two-wheel adventurers did make a publicized run earlier in 1962 but it wasn’t until NORRA put on a timed event with rules that history put it’s stamp of approval on it. News of those four separate classes with 68 original contestant’s accomplishments appealed to racers and fans alike and a new sport was born. Winners of that first event were Vic Wilson and Ted Mangels driving “Old Red” a Meyers Manx buggy. In the same year the Mint 400 (a closed course) race was held in Las Vegas, NV. Yes, off-road racing had officially began. As time went on environmental issues in America began forcing more, and more, land closures so it became necessary to shorten up the cross country events. To justify my madness I looked to our friends at Wikipedia and found the term motocross is loosely derived from MOTOrcycles racing CROSS country. Therefore motocross. To separate outdoor motocross from stadium racing the term Supercross was coined. This term came from shortening up from the original “Super Bowl of Motocross.” Supercross is a more technical form of racing than motocross because of it’s man made obstacles designed with a higher difficulty level than motocross. Another aspect of Supercross was it being tailored for TV (much like short course). So if one was to borrow the Cross and add in Baja which everyone associates with desert racing, the term “Bajacross” makes perfect sense. Most realize this form of racing was designed to mimic off-road desert racing. 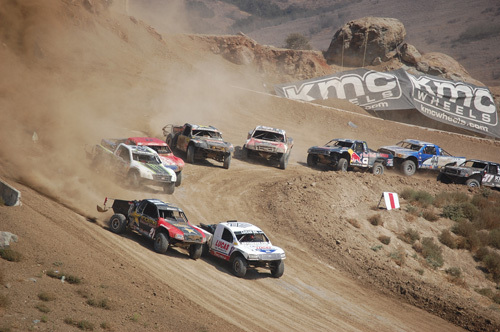 Desert racing is loosely considered a point to point race. Once someone decided to bring the action back to the start it was commonly called closed course desert racing. When it again went through its evolutionary change to a shorter version it was best described as Short Course. And so Short Course off-road had become an accepted description of this form of racing. If you were to Google short course racing you are directed to all types of racing. I wish it would have evolved into a more descriptive name such as Bajacross which, by the way, was the title of an earlier series. Being it is a short, closed course, with man made obstacles and has been described as Supercross with trucks and buggies the Bajacross title seems fitting. Even seven time AMA Supercross Champion, Jeremy McGrath, now a short course team owner and driver, qualified this when he once told NBC Sports, “For me, it’s like riding motocross in a truck.” Since this sport is intended to mimic the rigors of Baja and performed on a man made technical track, also designed for TV coverage, it seems logical to call it Bajacross. So, in this high tech society we live in where catchy marketing terms pop up daily why hasn’t the term Bajacross been coined as a “general umbrella term” to cover closed course, short course, or even stadium styles of racing. I’ve said enough. You get my intent.